Mercury Go with 5 is Back! Now is your chance to receive up to 5 years of factory backed warranty on your new Mercury Outboard! 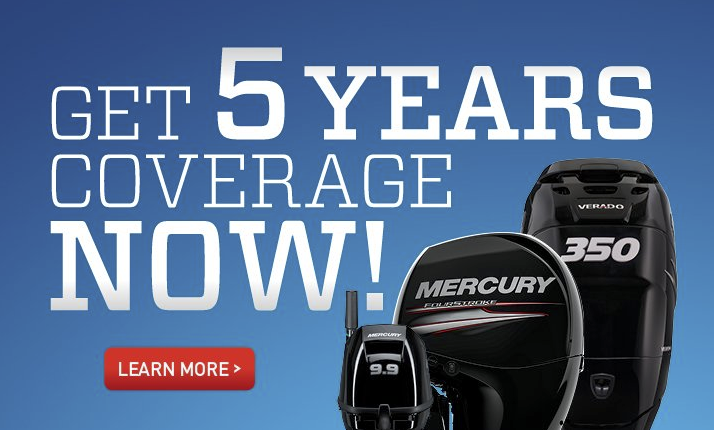 Get 2 additional years on top of your standard 3 year warranty on all new Mercury Outboards. This deal won't last long, so order your today! Clearwater Marine is also your certified Suzuki Outboard dealership! We offer every model of Suzuki Outboards, as well as all parts and accessories from Suzuki. With short wait times for special order outboards from Suzuki, we are able to get you the motor you need, when you need it. We also provide full service options for Suzuki outboards, meaning you can buy and service you outboard all in one place. We have fully electric and manual models upon request. Limited quantities available for each motor so be sure to get yours before they're gone! f we don't have what you are looking for, let us know and one of our friendly staff will give you a call! Pricing and availability may change. Please see store for details. Send Our Sales Department an Email! We'll get back to you asap! Financing is made easy with Mercury Repower Financing! Need a new outboard or engine package? Financing has never been more affordable and easy as it is now. Mercury financing can open doors to the new reliable motor you need while out on the water. Come in to our showroom and speak to our sales team for assistance with applying for financing. It's fast, easy, and free! Videos and pictures property of Mercury Marine and/or Clearwater Marine Inc.